Bridging the gap between Professional Fishermen and Science! The Cobia (Rachycentron canadum) named “Kyle G” (Tag ID: GFR12825) was originally tagged & released by angler Eric Gineman while fishing with Captain Dan Zier and mate Garrett of the Second Nature charter boat on December 8th, 2016. The crew was fishing the waters just offshore of Key West, Florida, USA. The Cobia was measured to be 32 inches (81.28 cm) total length and had an approximate weight of 10 pounds. The team used live bait and tagged and released the fish in excellent condition. Nearly 8 months later, 239 days to be exact, on August 3rd, 2017 that same Cobia was recaptured by James White while fishing with Captain Ray and the crew of the Miss K-C fishing charter out of Panama City, Florida, USA. 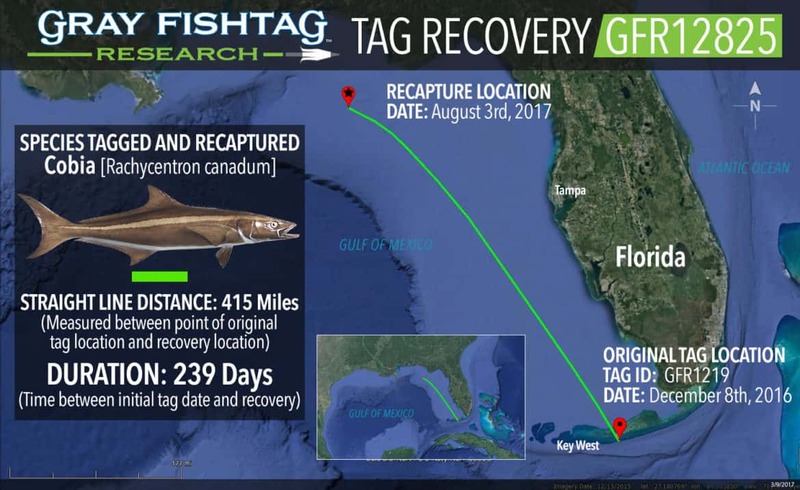 Incredibly, the Cobia recapture occurred in the northern Gulf of Mexico approximately 415 miles (668 km) away from the original tag location. The fish was caught in excellent condition and had grown to a length of 36 in (91.44 cm). Species Information: The Cobia (Rachycentron canadum) is a species of perciform marine fish, the only representative of the genus Rachycentron and the family Rachycentridae. Cobia are a torpedo shaped fish with a pointed face and is characterized by dark olive brown coloration on the dorsal side and silver grey coloring below. Cobia are a solitary pelagic fish but are often found near floating objects or any structure in the open ocean. Cobia is sought after by the both the recreational and commercial fishing industry due to their exciting fight and their good taste. GFR Cool Facts: The predators of the cobia are not well documented, but the Dolphinfish (Coryphaena hippurus) is known to feed on juveniles and the shortfin Mako shark (Isurus oxyrinchus) feeds on the adult. Recaptures such as this one are truly amazing and entice us to continue our quest of tagging fish and learning more about each species. Our program is constantly growing with new species being tagged in new regions every day. However, to continue to expand effectively we need your help. We like to deploy satellite tags on various species to take the guess work out of the migration patterns. This Cobia was swimming healthy for 239 days and was recaptured an incredible 415 miles away. One can only imagine where it went between the original tag location and its recapture location. The information we could produce with the data a satellite tag could have provided insight. We are actively seeking funding to continue to provide data and conclusions to the general public at no cost. Get involved today! The Second Nature charter boat crew in Key West will receive some Gray FishTag gear for their tagging efforts. The tag recovery angler, James White, will receive a pair of Costa Del Mar sunglasses, a Tag & Recovery Certificate, and Gray FishTag gear for reporting the tag recovery. The tagging and research efforts is made possible by our research centers and sponsors: AFTCO, AA Video, American Fishing Wire, FECOP, Costa Del Mar, CR Primo Fishing Tackle, Seaguar, Shadow Graphics, SquidNation, AquaWorld, Crocodile Bay Resort, Grande Alaska Lodge, Los Sueños Resort & Marina, Marina Pez Vela, The Pisces Group and The Zancudo Lodge. The success of the program is made possible by the participation of the hard-working fishing professionals and the generous contributions from our partners and donors. Any contribution is tax deductible and will go directly to support our cause and help the growth of the program.